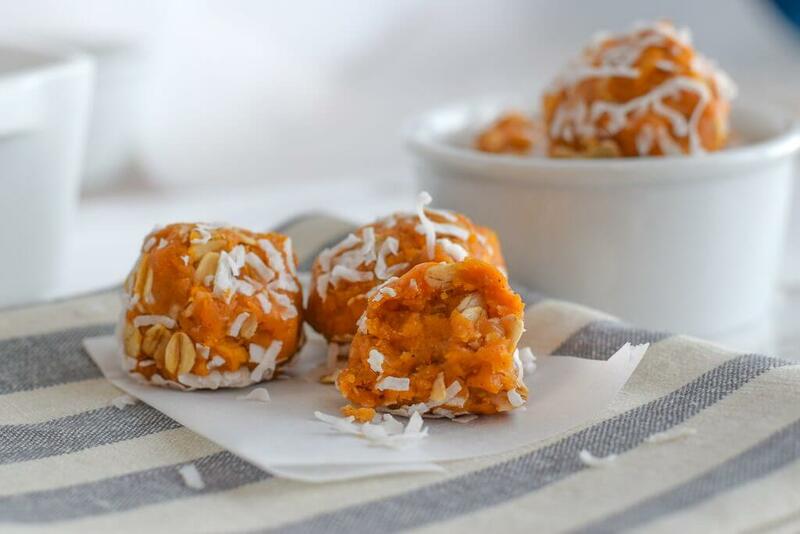 These portable Sweet Potato Coconut Ginger Energy Bites are a great on-the-go pre-run snack. With quick carbohydrates and a tiny bit of protein and fiber for staying power, these energy bites can power you through a short run, or hold you over post-run until you are able to eat a balanced meal. Enjoy the flavors of sweet potato and ginger in a sweet coconut coating. 1. Combine all ingredients in a large bowl and stir until well combined. Place bowl in fridge to firm up (about 20 minutes). 3. Remove from fridge and enjoy for a pre run snack! Notes: These will last up to a week in the fridge. 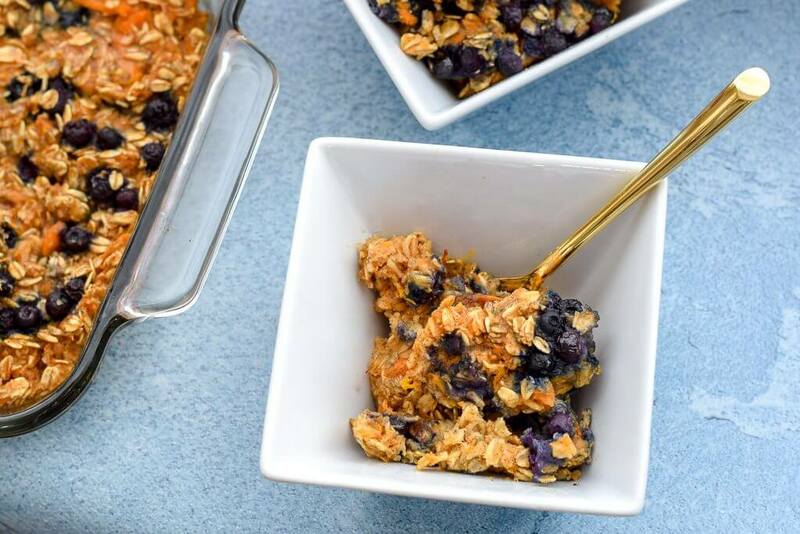 This Sweet Potato Blueberry Baked Oatmeal is the pre-long run breakfast of your dreams. This healthy form of “carb loading” offers complex carbohydrates through oats and sweet potatoes to power you through your long runs. You’ll also get some electrolytes and ample antioxidants to help counter muscle breakdown. Allow at least an hour to digest after eating before your run so your muscles can utilize the carbohydrates for energy. If enjoying after your run, slather with yogurt or peanut butter, or pair with eggs or a protein shake for necessary protein! 2. Coat the inside of a 2 quart baking dish with butter, oil or non-stick spray. 3. Mix dry ingredients (oats, cinnamon, salt, baking powder). 4. Beat in milk, eggs, sweet potato, butter, maple syrup, and vanilla extract. 5. Mix all ingredients together, saving blueberries for last to prevent staining and/or crushing, and spread inside the dish. 6. Bake for 30-35 minutes, until oats are tender and moisture has been absorbed. 7. Drizzle with a little maple syrup, to taste. 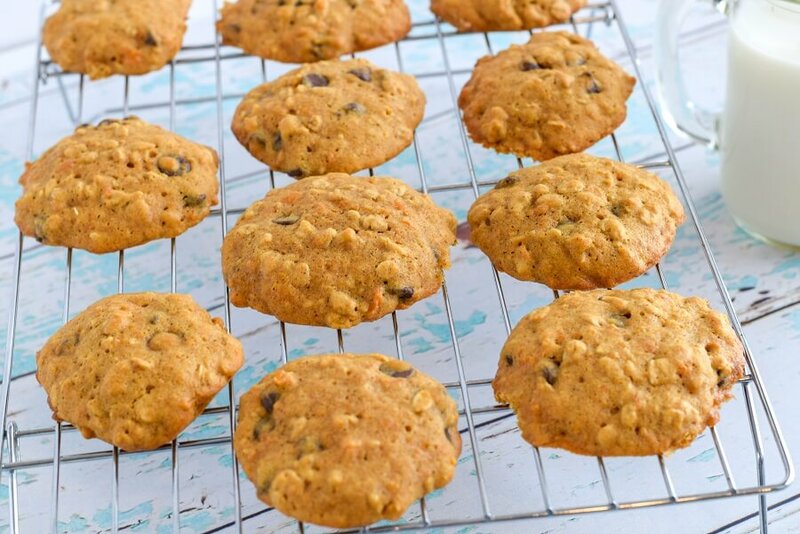 These Sweet Potato Energy Cookies are a great pre-run carbohydrate snack, perfect for your sweet tooth. With a blend of simple and complex carbohydrates, they will provide both quick and longer lasting energy to power you through your run. They are great for on-the-go snacks, too. You won’t want to share these! 2. In medium size mixing bowl, whisk together dry ingredients (flour, oats, baking soda, spices). 3. In separate mixing bowl, whip butter and sugars using an electric mixer. Add in egg, vanilla extract and mashed sweet potato. 4. Add dry ingredients to wet and mix until combined, adding in chocolate chips last. Batter will be wet. Let it sit for 5-10 minutes to firm up. 5. Scoop out dough in 1 ½-2 inch scoops and arrange on baking sheets. 6. Bake for 14-16 minutes. Allow cookies to slightly cool before serving. 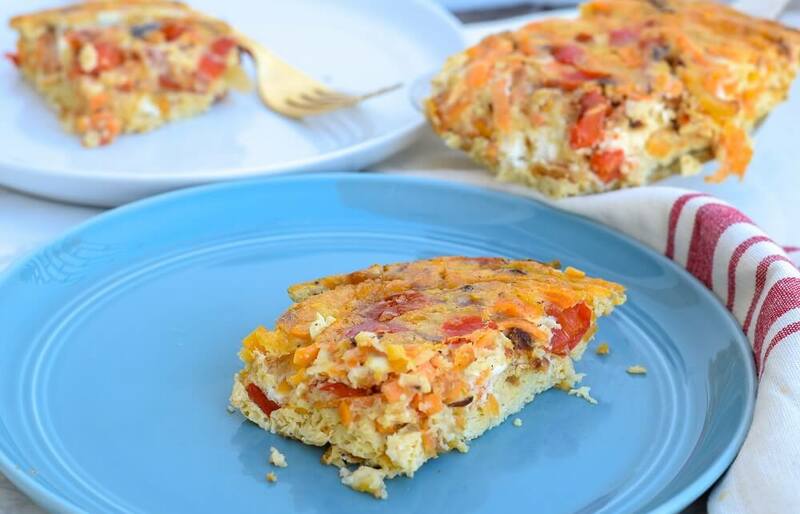 This sweet potato hashbrown casserole is the perfect meal for after your weekend long run. Paired with toast, biscuits or muffins, the carbohydrates and protein mixture will warm those muscles right up! It’s also packed with veggie rich antioxidants, like Vitamin C from the red peppers, sweet potatoes and tomatoes, and lycopene to help enhance your recovery. You’ll also load up on and replenish important electrolytes, like sodium and potassium. If you’re in a rush, shred the sweet potatoes the day/night before, so you can just pop it into the oven the day off. Or, prepare this the day before to enjoy immediately following your long run. 2. Wash, dry and peel sweet potatoes. Shred potatoes into hashbrown size. 3. Melt butter in pan over medium high heat. Add the onion, red pepper and tomato, sautéing until soft (about 3-5 minutes). Add 1/2 tsp salt, pepper and garlic powder and mix well. 4. In a separate bowl, beat eggs thoroughly and slowly add in milk. Add the other 1/2 tsp salt. Stir in the cheese, shredded sweet potatoes and sautéed vegetable mixture. Layer more cheese on top, if desired. 5. Transfer to 8×8 baking dish and bake 40-50 minutes or until the eggs are cooked through and set. 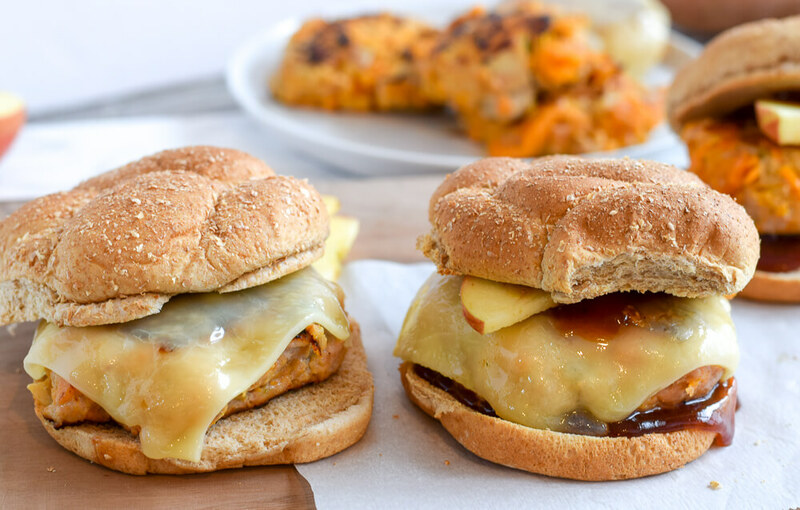 These BBQ Apple Sweet Potato Turkey Sliders are the ideal balanced meal for after your run. With ample protein to rebuild your muscles, and carbohydrates and antioxidants to refuel you, these sliders are the perfect combination of tasty and nutritious. Throw them on a bun to up your carbohydrate intake or eat them as is. Throw some apple slices on top if you want to add a sweeter crunch. 2. Cut 1 apple in half. Grate apple into medium sized bowl. Add spices, mashed sweet potatoes and ground turkey. Shape mixture into 5-6 medium size patties. 3. Heat olive oil in large skillet over medium high heat. Add burgers to pan and cook through, about 4-5 minutes per side. 5. Cut remaining apple into slices to top turkey burger (optional). Top with bbq sauce and sliced cheese. This bright hued post run smoothie is not only pretty to look at but is the perfect concoction of post run recovery nutrients. 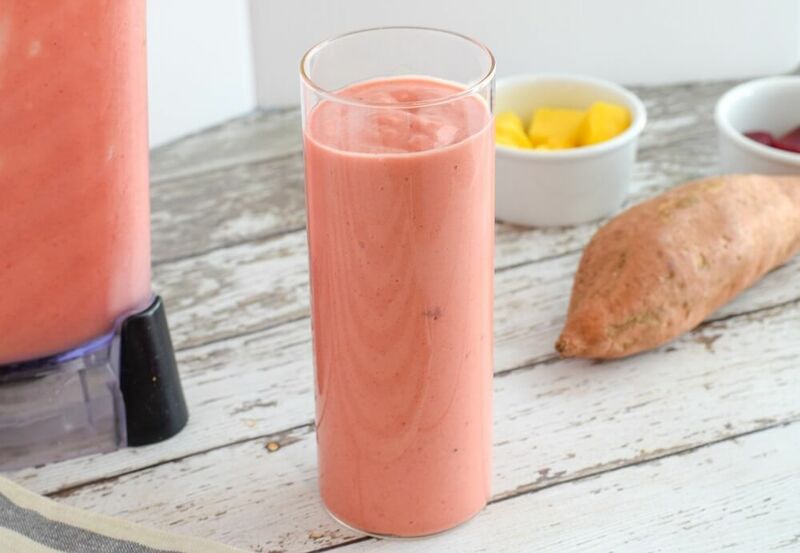 Using sweet potato as the base for complex carbohydrates, it also uses frozen mango chunks for some extra Vitamin A. It’s naturally sweetened with beets and maple syrup, and gets its creaminess (and protein!) from the greek yogurt. You’re getting the perfect 4:1 ratio of carbohydrates to protein, with a hefty dose of antioxidants and electrolytes as well. This smoothie can be eaten as a meal, or split in half as a snack. 1. Mix all ingredients into high speed blender and blend. Add more ice and sweetener as needed.